Traditionally, the stone needed to create natural tile was challenging to extract and manufacture, but all that is changing. New technology presents an array of opportunities, with modern stone tile quickly becoming surprisingly versatile and affordable. Additionally, new stone care and cleaning techniques make it easier to keep natural Italian stone looking as pristine as it did upon installation — for years, even decades, to come. Those who purchase tile and maintain it carefully ultimately enjoy an unexpectedly affordable finished product in the long run. One look at stylish stone tile, and it's easy to see why Italy remains at the forefront of stone manufacturing. To gain a real appreciation for the magnificence of stone, it's important to understand how it's formed, extracted and manufactured, and how Italian designers use it to create the world's most beautiful tile. Natural stone is, obviously, not man-made, but it does require human effort to transform it from raw material into gorgeous, sophisticated tile. Formation begins long before humans get involved. However, the manner of formation depends somewhat on the type of stone; travertine results from the long-term accumulation of layers, while extreme pressure creates other types of stone such as marble. Still, others occur when magma melts rock and reforms it into beautiful new stone. The manufacturing process for Italian stone tile involves a unique mix of art and science, with technology enhancing a process that has been built on and perfected for millennia. Thanks to new technology, extracting and polishing stone is not the backbreaking work it once was, although it still requires great precision and passion. The process begins in a quarry, where experts simultaneously play the roles of artisan and tech guru. Site selection is essential; experts collect samples via diamond-tipped drill bits to ensure they extract the best possible raw material. From there, high-speed, exceptionally accurate machines cut a bench wall from the quarry. These machines ease what was once the most laborious aspects of the tile manufacturing process. Diamond wire cutting technology allows for extreme precision. 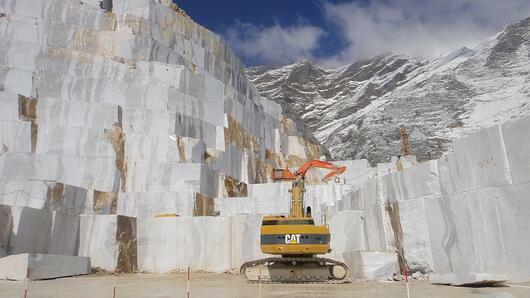 Once stone is extracted from a quarry, it's cut into slabs with high-speed saws. Fitted with several 12-foot blades, a series of special gang saws makes parallel cuts. These cuts are chosen carefully based on the desired look. Thousands of years of forming through sedimentary or metamorphic processes grants stones unique patterns, which can be displayed quite differently based on the chosen cut. The ensuing slabs are then polished according to the designer's desired finish. Depending on personal preferences, this could mean completely smooth slabs of stone or a rougher, more rustic texture. The final step involves fabrication, with each slab customized for installation purposes. Specialized saws shape and polish each slab's edges. Every detail matters. The process can vary somewhat based on the type of stone used to produce contemporary tiles or stone mosaics. For example, slate is typically cut into smaller blocks and split with a special chisel. Specific steps may also differ based on the desired finish and cut. 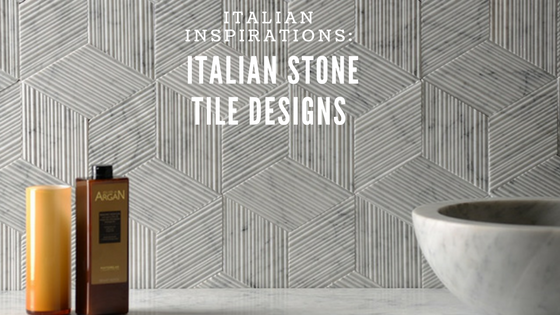 Take a quick glance around any Denver, Vail or Aspen tile showroom , and you will immediately observe the influences of talented Italian designers. The industry has centered around Italy for millennia, and that trend is not about to abate. 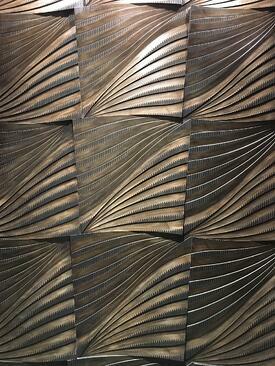 Italian designers bring great artistry and pride to their craft, never resting until contemporary tiles are perfect. Italian tile shows are essentially the flooring version of New York Fashion Week. This is where all the edgiest and most established designers flock to share their latest decorative ceramic tile and modern porcelain tile creations and draw inspiration from one another. The most important tile show is easily Cersaie, held every year in late September and early October. Recent trends include hexagonal shapes, large-format tile, unique textures and pop art. A variety of tile materials are represented, including traditional ceramic tile, wood tile porcelain, and of course, travertine stone tile and decorative limestone. After witnessing the most recent stone trends in Italy, designers from all around the world set to work, bringing elements of the latest trends to their home turf. They also draw inspiration from the fashion world, including the aforementioned New York Fashion Week. Ultimately, however, Italy has top say in what will be trendy in any given year and what consumers will demand from designers. Tile is endless in its versatility, but ultimately, designers return again and again to the traditional yet contemporary look of natural stone. Admired through the ages, this gorgeous flooring material will continue to be a hit among leading Italian designers in years to come. Ready to get in on the Italian stone tile trend? Come explore our inspiration gallery and contact us to learn more.